The Apache attack helicopter is the British Army's most awesome weapons system. Deployed for the first time in Afghanistan, it has already passed into legend. The only thing more incredible than the Apache itself are the pilots that fly her. For the first time, Apache Dawn tells their story - and... read more their baptism of fire in the unforgiving battle of Helmand province. Their call-sign was 'Ugly' - and there was no better word for the gruelling 100-day deployment they endured. Day after day, four of the Army Air Corps' finest pilots flew right into the heart of the battle, testing their aircraft to the very limit. 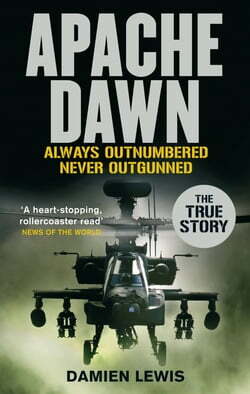 Apache Dawn takes the reader with them on a series of unrelenting and brutally intense combat missions, from daring, edge-of-the-seat rescues to dramatic close-air support in the white heat of battle.Bestselling author Damien Lewis has been given unprecedented access to these heroic aircrews and to the men on the ground whose lives they saved. It is an astounding story of bravery, skill and resilience in the face of unbelievable odds. And it is the story of the Apache itself - the ultimate fighting machine.